European base metals explorer Zinc of Ireland NL (ASX:ZMI) has provided a promising update in relation to the Phase 3 drilling program being conducted at its 100%-owned Kildare Zinc Project in Ireland. The company has now completed the first four holes and two more are currently in progress. First assays are expected shortly, a possible share price catalyst given the quality of assays and grades identified to date. 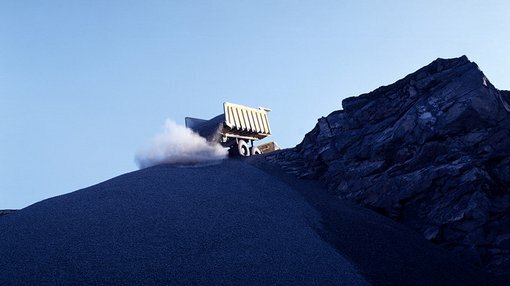 ZMI also has macro tailwinds with the zinc price having surged 10 per cent from circa US$1.36 per pound three weeks ago to surpass the psychological US$1.50 per pound mark overnight, representing a 10-year high. The Phase 3 program is designed to test extensions to zinc-lead mineralisation at the McGregor Prospect, which hosts the majority of the Kildare Inferred JORC Resource of 5.2 million tonnes grading 8.6% zinc + lead. However, management is also looking to follow-up on the recent discovery at the Celtic Tiger Prospect along the western margin of the Allenwood Graben. As indicated below, this lies approximately 1 kilometre to the west of McGregor and should ZMI identify trend extensions this would be a positive development for the company. 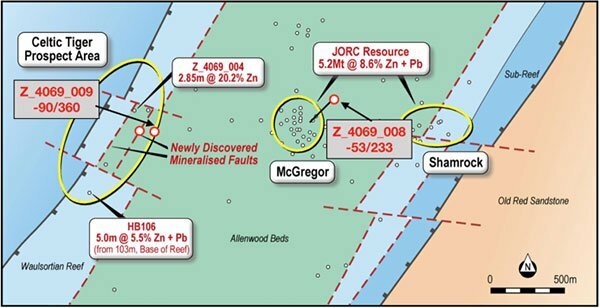 The second drill hole at the McGregor prospect identified above as Z_4069_008 intersected zinc mineralisation in the form of sphalerite (ZnS) in zones of massive sulphides, breccias and fault mineralisation in the Base-of-Reef target. ZMI is in the process of preparing samples and a second batch has been dispatched which will be the subject of the release of further assay data. Managing Director, Peter Van der Borgh said he was encouraged by the Phase 3 drilling at McGregor, given both holes have intersected massive sulphides, breccias and fault mineralization. Looking at the bigger picture, it should be noted that the Phase 3 program at McGregor builds on the spectacular intercept of 23.25 metres grading 13.5% zinc + lead, including 7.69 metres grading 18.2% zinc + lead (true thicknesses) encountered in the Phase 2 program, which was drilled after the calculation of the ZMI’s maiden Inferred JORC Resource comprising 5.2 million tonnes grading 8.6% zinc + lead. Consequently, there is already significant scope for a material resource expansion and with ZMI expecting to receive assay results in the next week or so it is likely that investors will start to join the dots as management plots the additional drill holes that will provide the data for a potential resource upgrade.